There’s still plenty of time to get corn in the ground and expect good yields, says University of Missouri Extension specialist Bill Wiebold. His five-year research on planting date in central and northern Missouri shows that yield begins dropping by 5 percent the first week of May, 20 percent by the end of May and 40 percent by the end of June. Wiebold’s numbers are averages, and he points out that no one can predict yield based upon one year’s planting date. As a rule, stick with corn through the end of May, he says. Planting date is only one factor that determines yield. Temperature and precipitation in July and August affect yield more than planting date, Wiebold says. Soil conditions, rather than the calendar, dictate when to plant, he says. Avoid planting when the soil is wet. Working wet soil packs soil particles tightly together, leaving less room for water, nutrients and air to get to plant roots. Heavy farm equipment compacts soil, resulting in soil that drains poorly. Once compacted, it takes many years to rebuild healthy soil. There won’t be much crop planting in the week ahead, MU Extension climatologist Pat Guinan said during an April 15 MU agronomy teleconference. 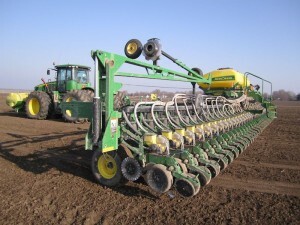 Regional agronomists statewide reported that farmers were “getting antsy” to plant. Only 4 percent of the Missouri corn crop has been planted, according to the April 14 USDA crop progress report. This compares to 8 percent this time last year and 15 percent for the five-year average. The west central and south central portions of the state show the highest percentage of corn planted with 13 and 18 percent, respectively.